How to prepare farm fresh organic Carrot Tops? Carrot Top Chimichurri!! Not only are carrot greens edible, they’re really delicious. This simple chimichurri recipe combines carrot tops with parsley, lemon zest, honey, garlic, chilis, olive oil, and vinegar. 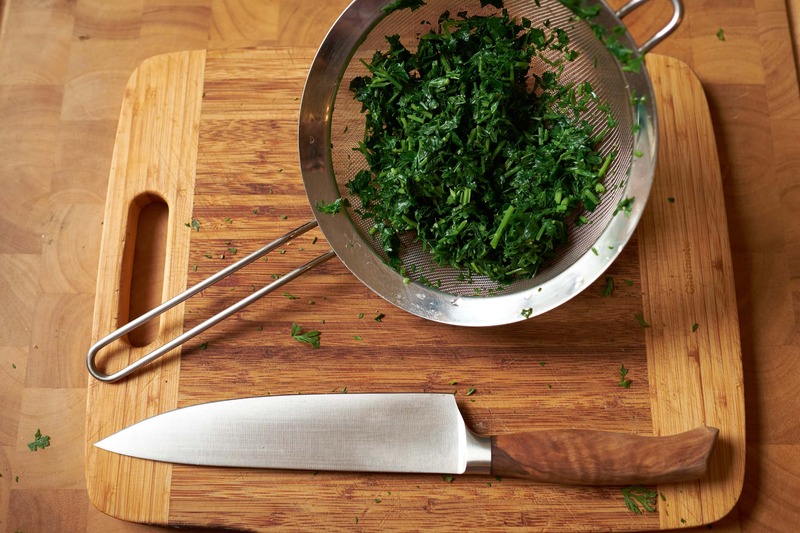 There’s a couple ways to process your greens for any Chimichurri. I gave them a rough chop then blanched them in boiling water before adding them to a food processor. Blanching the greens will keep them vibrant green for about 24 hours. This is an optional step but if you don’t do this it’ll look a little muddy pretty quickly. You could also blanch the greens prior to chopping them. This method is easier to dig them out of the hot water but then you’re left chopping wet greens. 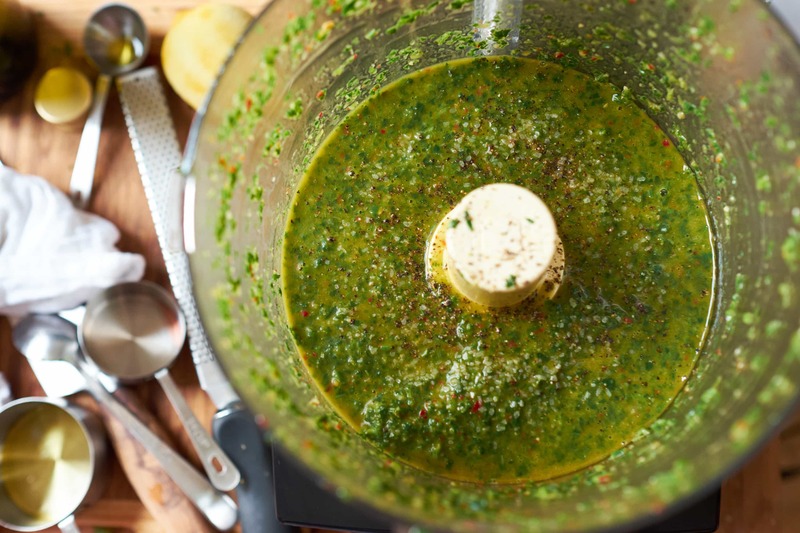 If you’re in a hurry and will be serving the chimichurri right away, go ahead and skip the blanching. 1. Here I want to note that I did this backwards as a test and the results were fine…. 2. 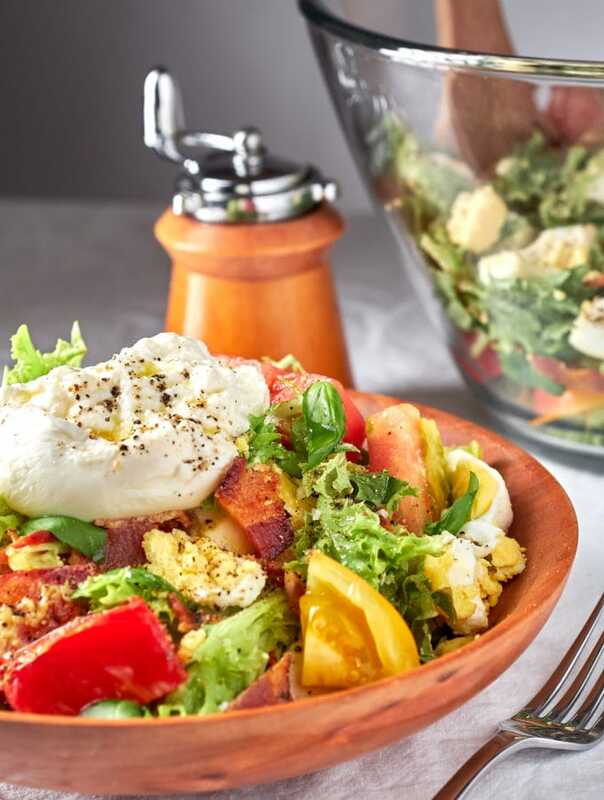 Normally you would blanche then chop your greens. Chopping first gives you a better gauge as to how much your working with…. 3. I lost about a 1/4 cup of greens in the process. Otherwise the result are about the same. For the garlic and chili paste I like to use a chef’s knife and about 5 minutes of chopping and smushing. You could use a mortar and pestle if you’d like. Either way you want to make sure to make the paste before you add it to the food processor. 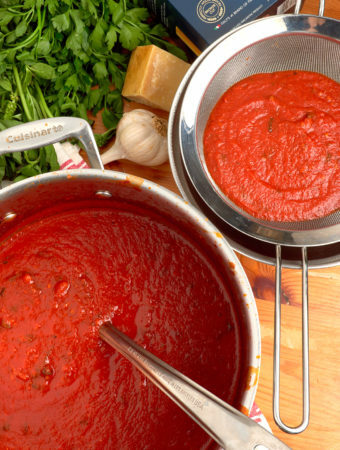 This really brings out the natural oils of the garlic and chili prior to getting sliced up in the food processor. 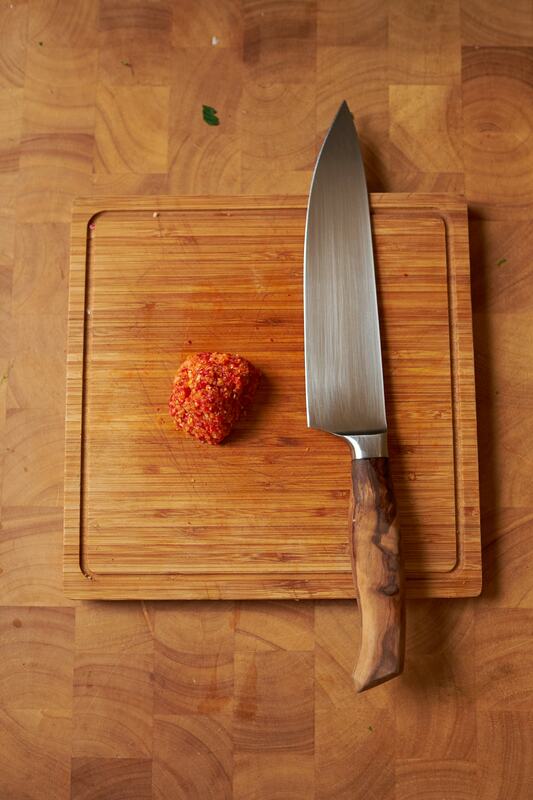 Finely mince the garlic and chilis in to a paste with your awesome knife skills. Or use a mortar and pestle. Add a pinch of salt and a few drops of olive oil. 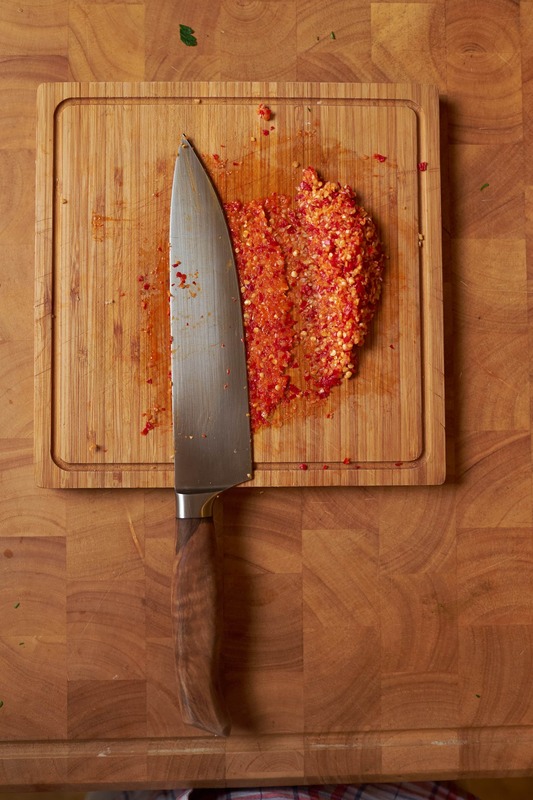 Use the flat side of your knife to much the ingredients in to a paste. Garlic and Chili Paste takes about 5 minutes. Personally I think this is easier than a mortar and pestle. Thanks for the knife skills Jaques Pepin! 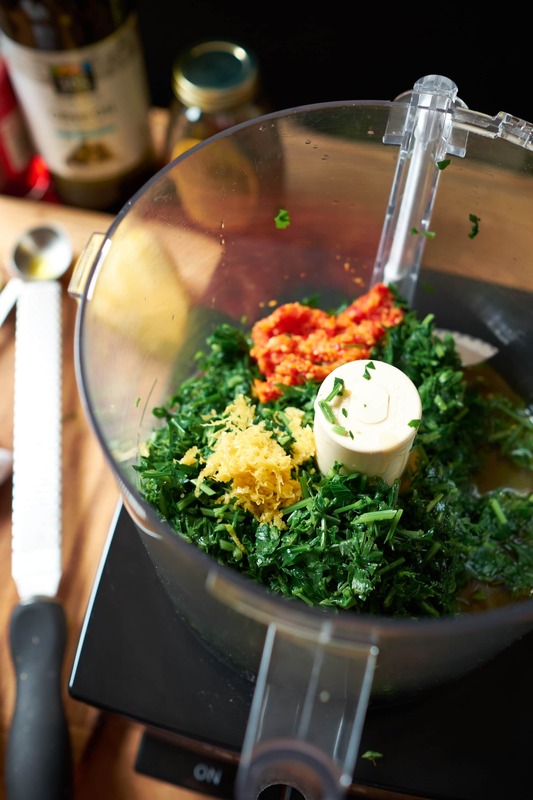 Once you get your greens chopped and blanched and your garlic chili paste smashed, you can add them and half the oil and vinegar to your food processor. Add some honey and the zest of one lemon then start your whizzing. Slowly add oil and vinegar to get to your desired constancy. 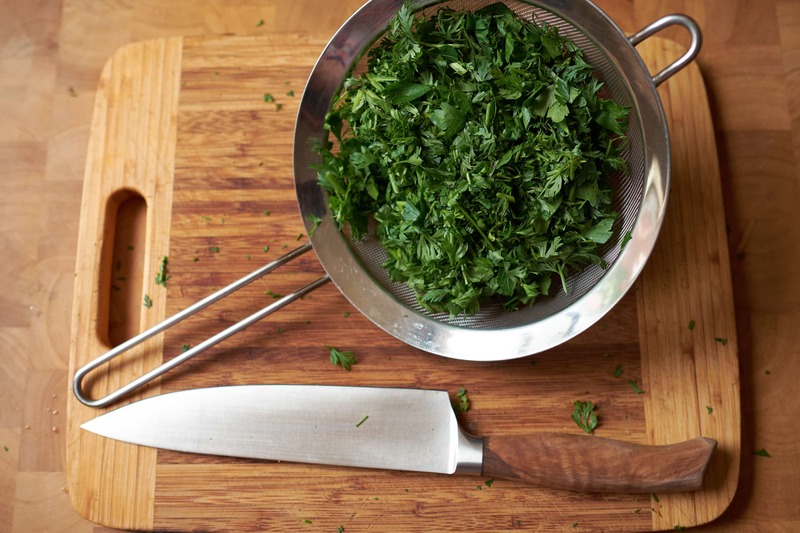 It’s hard to say how much to use because a bunch of carrots and a bunch of parsley will always be different. It’s hard to mess it up at this point so don’t worry too much about it. 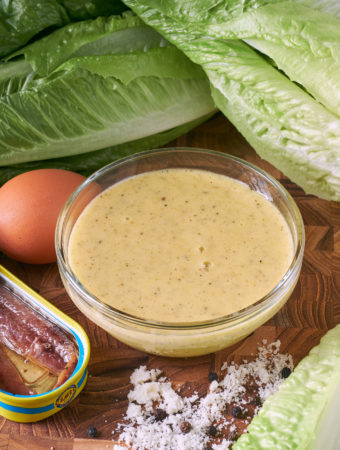 Combine greens, paste, honey, and half the oil and vinegar. Process until well combined – about 1 minute. Then slowly add more olive oil and vinegar to reach desired consistency. This Carrot Top Chimichurri might be one of the most addictive things I’ve ever made. It’s been hard not to eat it on everything this week including slices of fresh bread, Coffee Rubbed Flank Steak, and steak and eggs. 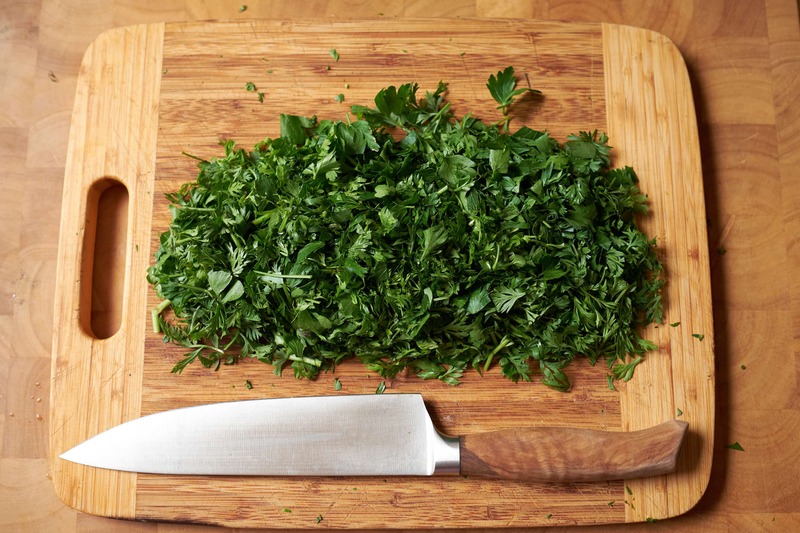 If you can’t get hold of carrot tops you can go ahead and use two or three bunches of parsley. How to prepare farm fresh organic Carrot Tops? Carrot Top Chimichurri!! Not only are carrot greens edible, they're really delicious. 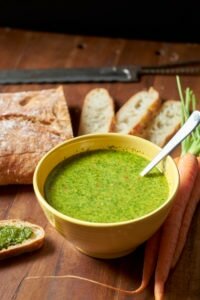 This simple chimichurri recipe combines carrot tops with parsley, lemon zest, honey, garlic, chilis, olive oil, and vinegar. 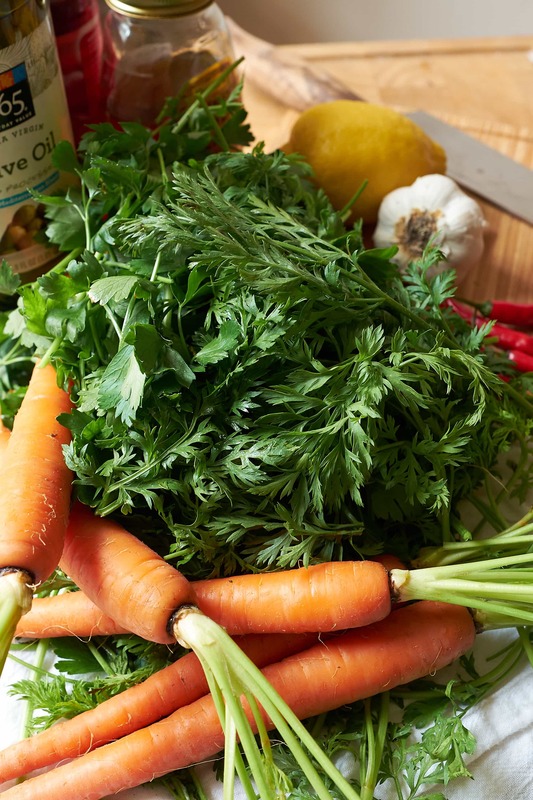 Thoroughly clean the carrot tops and parsley in fresh water. Blanche in boiling water for 30 seconds. Transfer to ice water to cool and drain thoroughly. 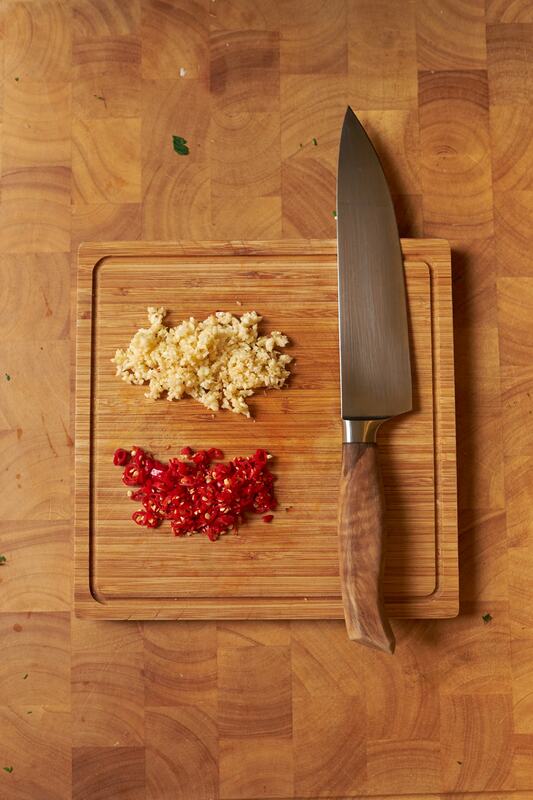 Finely mince or use a mortis and pestle to make a paste of the garlic and chilis with a pinch of salt. Roughly chop the greens and transfer to a food processor. Add garlic chili paste, lemon zest, honey, and 1/2 the oil and vinegar. Process until ingredients are combined - about 1 minute. Check consistency. Start processor again with the top on and slowly add olive oil and vinegar to achieve desired results. Add salt and pepper to taste. 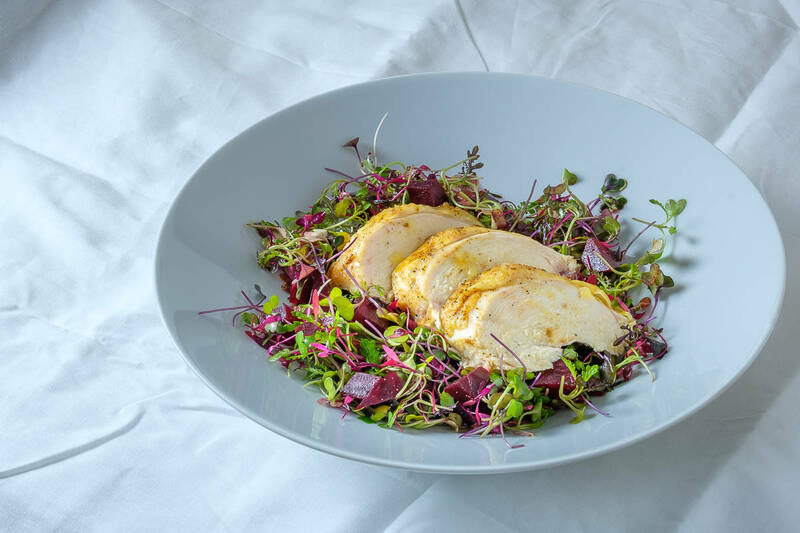 You'll use Olive Oil and Vinegar as needed for this recipe depending on how large your bunches of Carrot Tops and Parsley are. Quickly blanching the greens keeps them bright green for longer. Still, your chimichurri will start to oxidize within 24 hours.